Ever since I finally confirmed how to pronounce the brand name properly, (“lox- ee- tahn” incase you were unsure too!) I can’t stop name dropping it! Do you do that? I’m all like “oooh get me… French accent”. Now I just need to work out the ‘beauté’ in Le Metier… My D in A-Level French wants me to say “boat-ay” but people look at me like I’m a bit slow when I don’t make the “yew” sound… anyone? I’m digressing just a wee bit aren’t I? Anyway, look!!! It’s like the battle of the beautifully packaged prizes!! 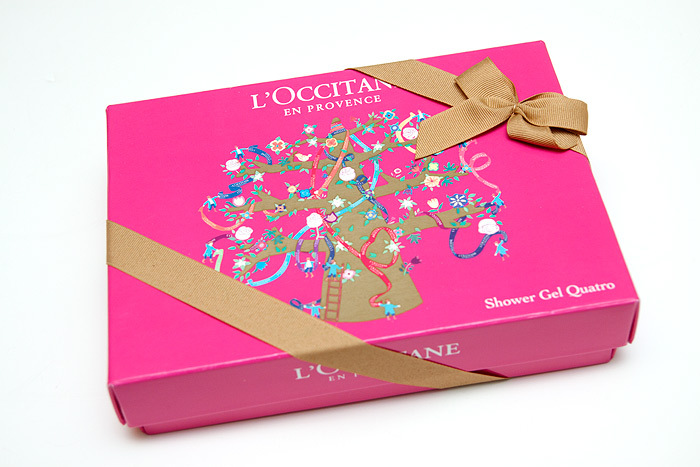 First, Liz Earle and now Provençal brand L’Occitane… that hot pink is swoon-worthy! 75ml Rose 4 Reines Shower Gel. Leave a comment to enter. Giveaway closes at 23:59GMT on 29th January. My lovely international ladies, I’m sorry but the rest of the daily prizes will be available only within the UK. I don’t want you to keep returning to enter only to be disappointed that you can’t. enter me please. The prise looks so interesting. Oooh please enter me! That packaging is so so gorgeous! Oh wow l’occitane! Enter me please! J’adore parlez en Francais…Please enter me, this sets sounds *merveilleux*. Didn’t think my French will help me with beauty products but it seems there are a lot with French names these days! Oh la la! Please enter me. Love L’Occitanne candles! Lovely scents! Enter me please! I <3 L'occitane! Not eligible but good luck UK ladies. not eligible but still trying! Oooh! I’ve only ever bought L’Occitanne for my mum as I couldn’t afford it for myself. Enter me please! oo-la-la … this looks lovely – please enter me for the draw – thanks very much! I have been calling it by the wrong name for yonks – glad to finally know what it is truly called! ugh… i love l’occitane. it seems so classy and pretty. same goes for this gift set! oh. ooohh, enter meee, i’d love to try L’Occitane! Not eligible but good luck everyone else! Bummer for us the USA! Good luck UK ladies! Not eligible, but wishing I was. Please enter me! Thank you! Not eligible to win this, but would like to win the “most dedicated”. Goin for most dedicated. Good luck ladies! Enter me for “Most Dedicated” please! Please enter me! I’m in tge cold and windy uk!! thank you! Not in the UK, so I’ll be forced (forced!) to buy these. Enter me please! Thank you! Don’t worry I took French for 13 years and it all evaporated out of my head the day after I graduated! Also, please enter me! Another beauty!!! You’re spoiling us!!! Yes please! I’m in the UK. Not in the UK. what a pity….good luck girls! I love L’Occitane! Their Shea Butter body lotion is the best I have ever used. Its expensive, but worth it IMO. The fragrances look so exquisite! Enter me please, I’d love to win! oh this is lovely thank you! Lovely lushious goodies! So why am I not living in the UK? note eligible but still commenting. L’Occitane is super nice! Lossietane? Best shot I’m afraid. Oh oui oui enter ‘me please! My mum bought a set of L’occitane hand creams from QVC once (pretty pricey) and that’s the only reason why I know how to pronounce it 😛 These look cute! Enter me please. This is fab! I adore L’occitane but I can never afford it! I love this brand! so please..enter me! More pretty boxes! Not eligible here though. You know, I was totally pronouncing the name wrong all this time. *red faced moi*. What a gorgeous prize. Oooh yes please!! Boat-ay is correct, but you need to add a french flourish to it, or it will just sound like…well, boat-ay! Hi, I keep up with your blog every day and I love your honest opinions! Ps I have always struggled with eyeliner and would love the liquid eye liner look… do you have any tips? So excited that I finally know how to say it (merci!). I’m going to start saying it all the time now and sound like I’m sooo in with the French. Please enter me. Ooh, pretty pink box. I’m sold! I was at a conference this weekend in the middle of nowhere so missed this entry, I was doing so well for most dedicated. Did you hear the one about the SLS-free bath foam that actually foamed?